Your support of World Vision’s mother and child health initiatives has helped bring improved health and well-being to families in Somalia, Uganda, and Zambia. Because of your faithful and generous partnership, pregnant and nursing women and young children are being cured of malnutrition and learning how to find and prepare healthy, nutritious food. 253,493 women and young children were provided with access to maternal and child health and nutrition services, which included 167,987 children younger than 5 during fiscal year 2018. Since these projects began in FY16, 582,162 women and young children have benefited from your support. 366,591 people were provided with access to maternal and child health and nutrition services, which included 197,079 children younger than 5 during fiscal year 2017. A recent random sampling of beneficiaries in Uganda showed the percentage of women having their babies in a health facility increased from 55 percent to 71 percent, and families with access to safe water improved from 59 percent to 86 percent. Thank you for sharing your blessings to provide these tools for transformation. Your gifts are making a difference. Where extreme poverty exists, pregnant women and children under 5 are dying too often, simply because they don’t have access to the most basic health information, care, and nutrition. We know what it takes to address this gap, and we’re bringing the solutions to the most vulnerable populations in the hardest-to-reach places. World Vision joins thousands of children and their families in sharing our gratitude for trained community health workers who are providing the valuable frontline healthcare and priceless knowledge that is critical to mother and child survival. Women in Ethiopia are receiving treatment for debilitating damage caused by having babies without the aid of trained medical personnel. 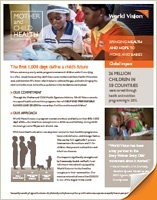 Children in Uganda are getting growth monitoring and referrals to nutrition programs when needed. Zambian health facility staff and volunteers are learning from U.S. medical service volunteers who are sharing their knowledge and time to improve care in two health facilities. 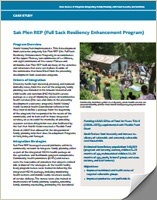 The USAID-funded Food and Nutrition Technical Assistance Project highlighted our USAID-funded project in Haiti as a successful example of integrating family planning into a large-scale food security project. World Vision implemented the community-based Maternal and Child Health Transformation (MaCHT) project from 2010 to 2014 in fragile-state South Sudan, funded by USAID. This program supported health system strengthening, mainly in the areas of service delivery, health workforce, and medical products, vaccines, and technologies. The project also informed policy at district and national levels and repositioned the maternal, neonatal, and child health (MNCH) agenda to further scale up these activities. An evaluation of the project showed progress and challenges in health system strengthening for maternal health practices and community case management of diarrhea, pneumonia, and malaria in children under five. 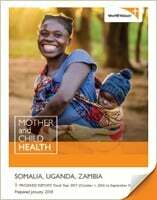 Coverage of essential maternal and child healthcare (MCH) increased in all single interventions, ranging from a minimum of 5% points to a maximum of 49% points during the implementation period. 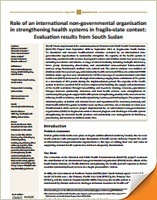 Read the full article and results of the evaluation in the peer reviewed African Evaluation Journal. 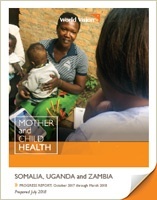 USAID recently published a collection of knowledge products from its Child Survival and Health grants, which include an operations research brief and one learning product from World Vision programs funded by USAID. World Vision tested an innovative supervision program for community health workers using the integrated Community Case Management approach to treating childhood illnesses in a timely manner in South Sudan. 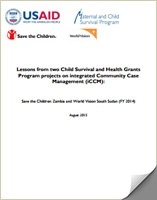 USAID recently published a collection of knowledge products from its Child Survival and Health grants, which include an operations research brief and one learning product from World Vision programs funded by USAID. 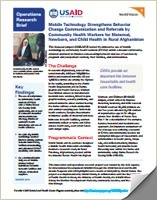 In Afghanistan, World Vision tested the effectiveness of mobile phones as tools for community health workers. 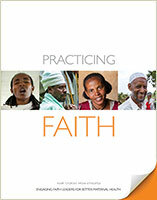 Faith leaders have the power to spur far-reaching changes in people’s attitudes and behavior. And those changes can bring extraordinary improvements in health and well-being. In Ethiopia, World Vision examined the role of faith leaders in improving the lives and health of women and children through the lens of four stories: Tsehay, who was suffering from fistula; Asmare, who is promoting safe births; Aberra and Shitaye, who are reducing religious barriers to family planning; and Ali, who is empowering women and girls. World Vision is a Christian humanitarian organization dedicated to working with children, families, and their communities worldwide to reach their full potential by tackling the causes of poverty and injustice. World Vision serves all people, regardless of religion, race, ethnicity, or gender. World Vision, Inc. is a registered 501(c)(3) nonprofit organization. All donations are tax-deductible in full or in part.